Picó, Fernando. Contra la corriente : seis microbiografías de los tiempos de España. Río Piedras, P.R. : Ediciones Huracán, 1995. “In another timely shift in approach to the rich archival documentation he uncovers continually, Fernando Pico offers six “microbiographies” (life stories of ordinary people) to illustrate the advantages of embracing certain aspects of postmodernism in the writing of history. 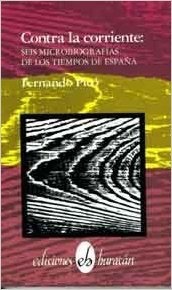 A brief introduction traces the impact on Puerto Rican historiography of a number of intellectual currents (Marxism, structuralism, dependency theory, quantitative studies, social history) and situates Pico’s own work comfortably within the European camp, namely the Annales school and its offshoots….